Apart from early childhood caries, traumatic dental injury is one of the main reasons for premature loss of primary maxillary anterior teeth in schoolgoing children. The greatest challenge in our specialty is to rehabilitate these patients esthetically and functionally to compensate the psychological impact of both the patients and parents. 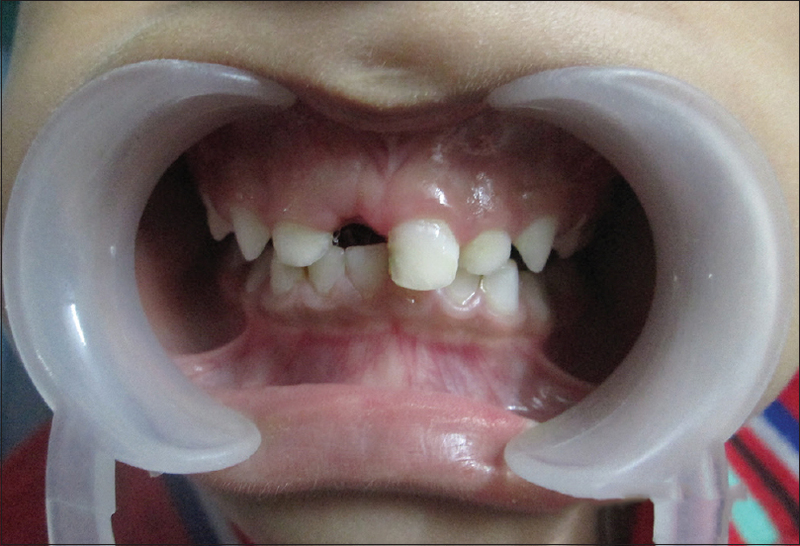 Parental desire is one of the main decisive factors for treating these types of clinical situations., Different types of appliance have been developed to manage the space in case of early loss of a primary maxillary anterior tooth. The choice can be either a removable or a fixed one, which can be functional or nonfunctional. The selection of the appliance depends on a number of factors including the child's stage of dental development, dental arch involved, tooth missing, and status of the teeth adjacent to the lost tooth. The best suitable space maintainer for a child patient is fixed ones as they are easily acceptable. A 4½-year-old boy along with his parents reported to our clinic with the complaint of missing tooth in his upper front teeth region. The parents gave the history of loss of his tooth due to fall on the ground 2 weeks ago. Parents did not report to any dentists at the time of trauma. The patient was very much reluctant to open his mouth even during speak and smile, which was parents' main concern. On intraoral examination, tooth 51 was missing along with normal surrounding tissue [Figure 1]. Radiographic examination revealed no retained root stump, with normal development of a permanent successor along with normal bony surrounding [Figure 2]. On completion of thorough case evaluation, we planned for placement of esthetic fixed functional space maintainer to alleviate parents' main concern. 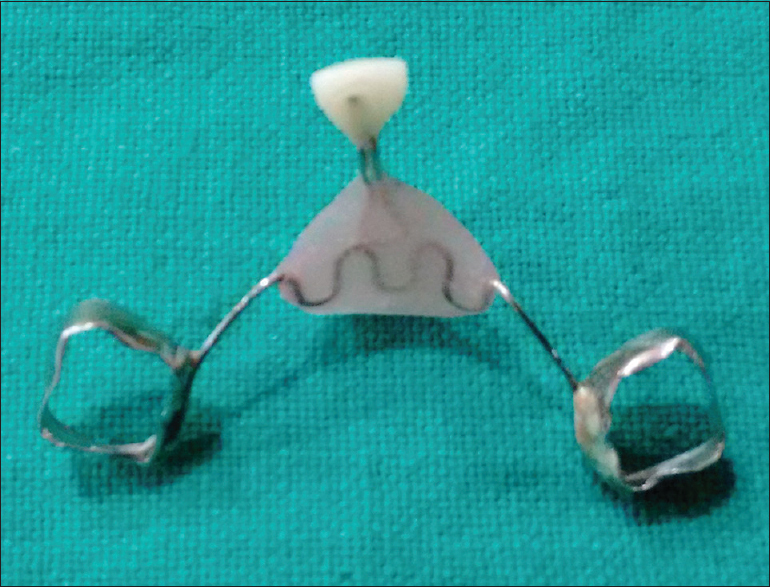 A 0.7 mm stainless steel wire with hook was placed from the edentulous area to the 0.9 mm SS wire. The final appliance was cemented on 55 and 65 with Type-I glass ionomer cement and occlusion was checked for any premature contact [Figure 5] and [Figure 6]. Figure 3: Framework of the space maintainer. Figure 4: Finished and polished space maintainer. Figure 5: Postoperative intraoral photograph in occlusion. 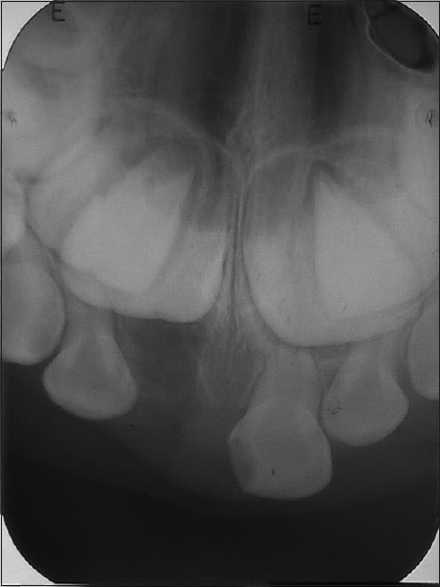 Figure 6: Postoperative intraoral photograph occlusal view. The patient was advised to maintain proper oral hygiene. The first recall of patient was done after 24 h followed by checkup every 3 months. The child and parent were very satisfied with the replacement of his lost teeth [Figure 7]. The parent was informed that the appliance will be removed around the age of 6–8 years after periodic radiographic evaluation, to prevent interference of erupting permanent successors. It was also advised to report immediately in case there was any problem with the space maintainer, including distortion or breakage. The follow-up was done 2 times at the above-mentioned interval without any complication. 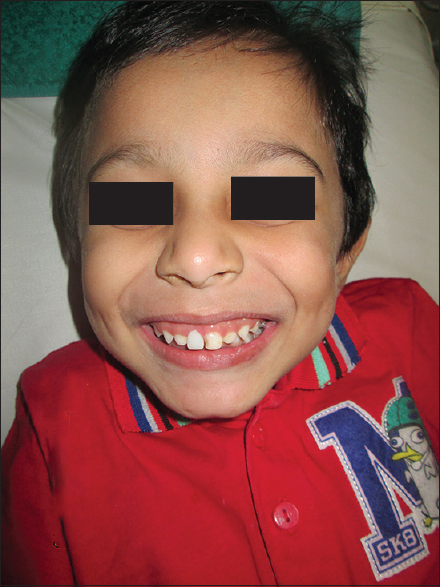 Figure 7: Happy and satisfied patient. 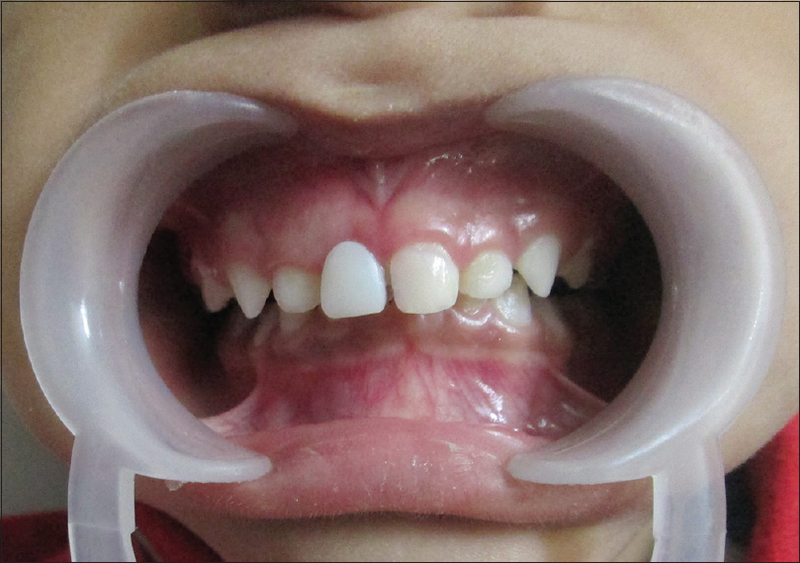 Premature loss of maxillary primary anterior teeth may lead to psychological disturbances and affect the child's self-esteem and socialization during the important phase of development. However, there is no strong evidence that early loss of maxillary incisors will have any significant, long-lasting effect on the growth and development of the child. Space maintenance in the anterior segment, from canine to canine, appears to be stable, even with the early loss of several incisors, with no net loss of space from canine to canine. Child's speech development following extraction of deciduous incisors remains somewhat controversial issue. The pronunciations of linguo-dental consonants (“t,” “d,” “s,” “sh,” and “ch”) and labiodental sounds (“f” and “v”) are affected., Hence, the placement of an anterior esthetic space maintainer is an elective procedure and is based strongly on parental desires. 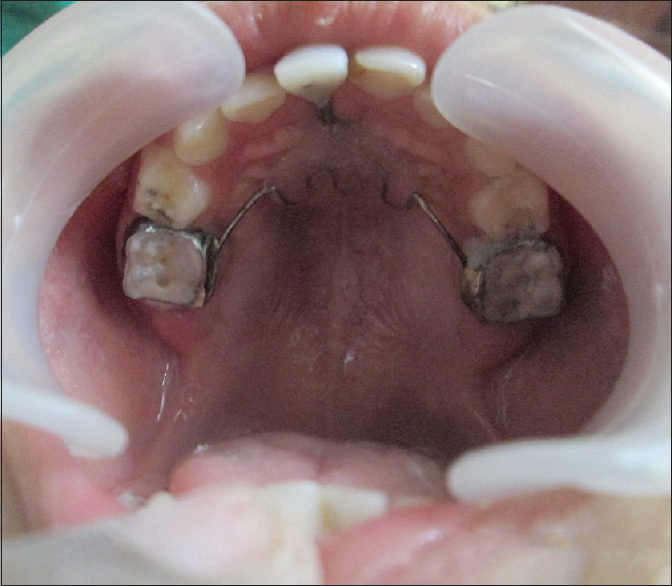 Fixed space maintainers are always acceptable in children as they have less desire to wear removable ones. The removable space maintainers cover large area of oral tissue causing irritation and discomfort. 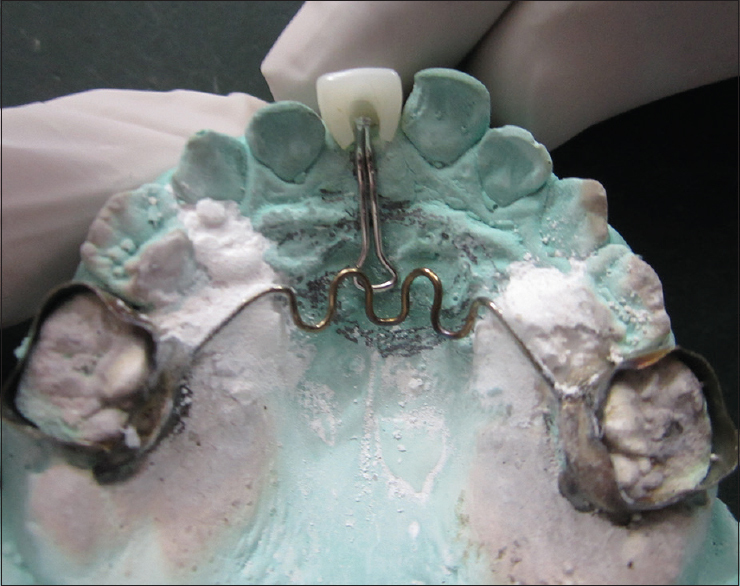 To improve patient acceptance, esthetic functional fixed appliance is reliable. In our case, a successful placement of fixed esthetic space maintainer was performed. Limitations such as long-term periodic follow-up (both clinically and radiologically), poor oral hygiene maintenance, and frequent distortion and breakage can be minimized by proper education and motivation of the child and parents. In our case, we have not encountered any above-mentioned limitation still now. Early intervention can prevent the psychosocial impacts of premature loss of primary teeth. In the present case, the appliance showed satisfactory result in relation to function and esthetics and further gave a psychological boost for the child. The patient and parent had been instructed to visit for follow-up periodically to monitor issues regarding oral hygiene and eruption of permanent teeth. Tandon S. Text Book of Pedodontics. 2nd ed. Hyderabad, New Delhi: Paras Medical Publisher; 2008. p. 446-65. Koroluk LD, Riekman GA. Parental perceptions of the effects of maxillary incisor extractions in children with nursing caries. ASDC J Dent Child 1991;58:233-6. Adewumi AO, Horton C, Guelmann M, Dixon-Wood V, McGorray SP. Parental perception vs. professional assessment of speech changes following premature loss of maxillary primary incisors. Pediatr Dent 2012;34:295-9. Waggoner WF, Kupietzky A. Anterior esthetic fixed appliances for the preschooler: Considerations and a technique for placement. Am Acad Pediatr Dent 2001;23:2. Scures CC. Report of the increase in bicanine diameter in 2 to 4-year-old children. J Dent Child 1967;34:332-5. Aswanth KP, Asokan S, John BJ. Fixed functional space maintainer: A weight gainer: A case report. J Indian Acad Dent Spec Res 2014;1:25-7.